Boomer travel bloggers showcase beautiful gates around the world that have caught their fancy and camera lenses. Gates are much like doorways in that they offer privacy or access, sometimes both. Like doors, they’re often hinged, opening and closing to create a boundary between the public and private. In this photoessay, my fellow travel blogger colleagues have graciously shared some of their favorites gates around the world. Some gates are formal; others more relaxed. They vary greatly not only in terms of their location and purpose but also in their materials and craftsmanship. 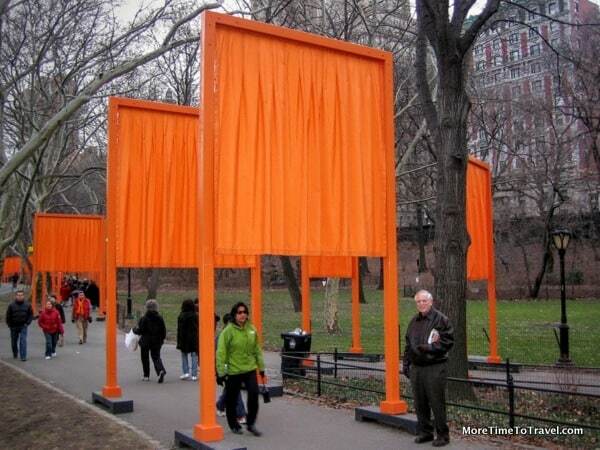 Each of these gates seems to evoke the history and beauty of their settings. This wrought iron gate marks the entrance to the Halifax Public Gardens in Halifax, Nova Scotia, Canada. The Victorian gardens, opened in 1867, include fountains, a bandstand, bridges, statues and urns among various formal gardens and water features. The Halifax motto, E Mari Merces, means ‘Wealth from the Sea.” Centrally located, the gardens provide a sliver of history and calm in contemporary Halifax, and a choice meeting place. Anyone visiting Copenhagen will immediately recognize the entrance to this famous amusement park in the center of the old district. Tivoli Gardens is one of the main attractions and must-see destinations in the city, best seen later in the afternoon to evening when the lights of the attractions and rides really make this park so festive and lively. This beautiful gate stands in the UNESCO-listed Place Stanislas in Nancy, France. My wife and I took whirlwind tour of France during on our honeymoon. When her Mom found out we were touring France she insisted we stop in Nancy. Why? Her name is Nancy. Although we spent only two hours one very early morning strolling around Nancy we were glad we did. The architecture in the Place is breathtaking. The area around Place Stanislas includes the Notre-Dame Cathedral of Nancy, the city hall and the Place Stanislas Arc Héré and the Fountain of Neptune you also see here. I was volunteering with an NGO and studying Spanish in the Mayan town of Panajachel in the highlands of Guatemala when I discovered a luxury hotel that offered day passes. I spent an enjoyable afternoon basking in the hotel swimming pool and enjoying the stunning views of the volcanoes surrounding the lake framed by this beautiful wrought iron gate. You’ve heard of Folsom Prison, probably via Johnnie Cash’s famous tune. Who knew it had such attractive stonework and a really nice gate? I also enjoyed the tiny museum. Located in Folsom, California, a little town in the Gold Rush Country northeast of San Francisco. I love the grand entrance to the main courtyard, “Cour du Cheval Blanc,” at Château de Fontainebleau. This is one of the largest chateaux in France and many monarchs used it as their residence. So it is fitting that the massive iron gates are accented with ornaments such as the gold eagles on each pillar. Once past the gates, visitors are treated to French Renaissance architecture and furniture. One can visit the Royal apartments and tour the the lavish gardens and courtyards. Château de Fontainebleau is only an hour south of Paris and easily reached by train. Although I visited the spectacular island of Curaçao four years ago, I remember this incredible building so clearly. These are the gates to the Mikvé Israel-Emanuel Synagogue in Willemstad, Curaçao. The Jewish faith has been practiced here without interruption since 1732 and it is the oldest surviving synagogue in the Americas. After walking through these gates, I was captivated by the rich history and beauty of the room. Additionally, there is deep, white sand covering the floor. How fascinating! The floor pays homage to those earliest Jewish settlers in Curaçao who had to muffle the sounds of their footsteps and prayers when meeting in secret during the Spanish Inquisition. We found this gate on a side street on Santa Fe’s historic eastside and had to immortalize it. It’s so Santa Fe! We were trying to get a logo designed for business cards but it wasn’t coming out right. My daughter-in-law said we had to have them ASAP so we picked the gate photo. We call it the “accidental logo.” One day I dropped my business cards in a gallery. The owner looked at one and said, “That’s my gate.” A tense moment ensued; but, whew! She was okay with it. Eight years later it’s still our logo. This jaunty fellow guards a somewhat hidden cement bunker in historic Occoquan, Virginia. Dated 1914, the bunker stored carbide, which was used for lighting in rural areas. Though inexpensive, carbide was prone to explosions so it had to be stored carefully. I love the bunker man’s stylish jacket and mustache. The grate designer has cleverly added a three-dimensional oil lamp, lamppost, and cat into the image. Occoquan makes a wonderful DC day trip, and you’ll find this fun grate across from the Mill House Museum and footbridge over the Occoquan River. These split gateways are found all over Bali, and are called Candi Bentar. They form the entrances to many temples. This split gateway is at Uluwatu Temple, or Pura Luhur Uluwatu, which is one of the six major temples believed to be Bali’s spiritual pillars. This temple is where you see epic sunsets and also where you see the enchanting and mesmerizing chanting of the Kecak Fire Dance. This is a royal gate fit for an official Royal Park—-Greenwich Park in Greater London. Behind the gate is the Old Royal Observatory where you can have a corny photo of yourself taken standing astride the Prime Meridian, with one foot in the Western Hemisphere and the other in the Eastern Hemisphere. You can also visit the buildings of the Old Royal Naval College. Greenwich Park is part of Maritime Greenwich, a UNESCO World Heritage Site. This gate is from one of the Starwood Hotels’ Luxury Collection Haciendas – the 18th century Hacienda San José near Mérida on Mexico’s Yucatán Peninsula. I love the history and the charm you find at these romantic throwbacks to a kinder, gentler age. *All photos were taken and contributed by the respective bloggers. Visit their websites to read more about their travels and to enjoy their photography. Thanks for your contribution! I thought all of the gates were inspiring, too. wow, gorgeous, I love this whole series of portals/gates and doors, lovely entries. Thanks for including Boomeresque in this post. I thought it was a great idea for a collaborative post. Just as I’ve learned to not to judge a book by its cover, I’ve learned to open the gate. Thanks for including our photo in your gate collection Irene. Such artistry and creativity have gone into building all these beautiful gates. It’s wonderful that you’ve compiled this lovely collection. This wonderful array of door reminds us that new adventures lie beyond each new gateway. Thanks for including our Occoquan grate in the round-up! We have lots of nice gates to contribute too if you ever do a part 2. These beautiful gate photos certainly inspire the urge to travel. Love this idea for a photo essay! It makes for a fun (and free) thing to collect while traveling.